Perhaps you’ve heard of this phrase “net neutrality”. And about some tussle over it. And perhaps you’ve let it slide from your consciousness, because it doesn’t seem like it could concern you, especially in India. But lend me your eyes for a few minutes and let me tell you how India’s telcos and telecom regulators are trying to pull wool over them. First, is there a problem now? Actually no. You’ve enjoyed the internet, the way it’s supposed to be – freely and fully, till now. But in 16 days from the day I write this – April 22, 2015, the telecom regulators in India are preparing to recommend that it all change. Against you. Here’s what the big fight is all about. During this time, they’ve largely focused on selling voice minutes – while at the back end they have been using voice over internet protocol (or VOIP) to connect with other telcos and deliver calls using the internet. And given that the cost of VOIP is a tiny fraction of the cost of traditional voice calls they were charging, they raked in the moolah. So now the telcos want to charge for the internet differently, based on how you use it. By now you’re saying – sure, if I use more bits and bytes, I’m ready to pay more. Actually, as bandwidth is infinite, the cost of bandwidth goes down globally all the time, you rarely pay more. But the telcos know this. No – this is different – they want the right to charge what they want, when they want and how they want, with no logic whatsoever. In effect, if Airtel doesn’t like YouTube but wants to push its own video app Wynk – it wants the right to offer that for free while charging you a bomb to access YouTube. One of our telcos, Reliance, has already gone ahead with this Facebook-driven evil scheme called Internet.org – where you can access Bing for free, but you have to pay to access Google – and you have access to BabaJobs for free, while you have to pay for Naukri.com. They’ve sold it as a “solution for poor countries” but what they really mean is that it’s a “solution to keep countries poor”. But in India, the telcos have managed to get one person to write a “consultation paper” on behalf of the supposedly-independent TRAI (Telecom Regulatory Authority of India) asking for public opinion on allowing telcos to break net neutrality. The note – which is terribly written, and deeply biased, – and if you don’t want to read through 117 pages of shoddily-written propaganda full of deliberately confusing jargon, there’s a much shorter summary by my friend @Nikhil Pahwa of Medianama and a set of answers to frequently-asked questions at here. But if you want the really, really, really short summary, here is logic in the TRAI paper: Telcos have invested lots of money to build out the network. They used to make a lot of money off it. But now other people are making money on this network, because they innovated while the telcos did not – so this is a bad thing. So we need to let telcos charge people however they want so telcos can make the money they need. Basically: poor telcos. Sob, sob, sniff, sniff. For the following reasons. The first fallacy: that the telcos did us a favour. To start with, the airwaves are ours, the people of India’s. Telcos bid for and paid a license fee to our representatives, the government of India, to temporarily license our airwaves to sell their networks on it. So building out the telecom network in India wasn’t a favour someone did for us – we asked these firms to do it and they paid us for it and profit from it. They knew what they were buying, they paid for it, and they got it. Now the world has moved past their fat margins on their outdated technologies, and they’ve failed to innovate. Other people, not telcos, have built WhatsApp and Skype. Their problem. Not ours. Second fallacy, these firms are hurting financially. Nonsense again. Look at the publicly-quoted revenue figures of Indian telcos – and you’ll find that, like in any other business, some did very well, some did very badly and others did middlingly okay. Like in any other business. And look at them historically – they’ve all more than recovered the amounts they bid for the spectrum. No one is in the poorhouse. And even if they get into the poorhouse in the future, we don’t have any sovereign duty to help them out. Business is Darwinian. They didn’t innovate, we don’t need to bail them out. Third fallacy, that there is a natural reason we need to be telco-friendly as technology changes. Nope again. Consider this analogy. We own our water. Let’s say we want to license a firm or set of firms to distribute our water to residents across town. Some private and public firms, after open and transparent bidding, get these licenses. They distribute water, charge for it and all is well. Now imagine that the water distribution companies could have done any and all of these things all along – but chose not to. Now they get jealous of these other businesses – and want to be allowed to charge soft-drink users and water-park visitors any fee, without any logic, without it being based on water usage. Another analogy. Imagine if your electricity distribution companies – Tata or Reliance / BSES or whoever would suddenly get up and start charging more for electricity from you if you used efficient light bulbs, or if you were used appliances that consumed less electricity. Because they made less money as a result of your smartness. You’d say it was ridiculous. It is. Once, shoddier products. Like Reliance and Facebook who are together offering Facebook for free and Twitter at a price, or Babajobs free but asking you to pay to access Naukri, or forcing you to use Bing because it is free unlike Google – allowing anti-net-neutrality will make our internet experience worse. And I say this, not because I have any grudge against Facebook, Babajobs and Bing – but because I think we consumers should have the ability to pick whichever social network, job site and search engine we want – and not leave it to some rapacious telco or social network to decide what we should use. Two, higher bills. It’s one thing to charge for bandwidth – and no one should have a problem with that. The price of that is falling anyway, as it should. Today, I have a 2 mbps connection at home for the same amount that I used to have a 256 kbps connection a few years ago. And I’m happy to pay for 10mbps too, if it comes to my home or my phone and does so at price I can afford. Or I can choose to save money and stay at 2 mbps as it becomes cheaper. It’s my choice. But it is completely wrong for me to have to pay Airtel or Vodafone or some ISP any money to specifically access YouTube, or Skype, or any particular site that they decide to charge for at their whim and fancy. These folks are the pipe-layers and their job is to push stuff through the pipes – which we can pay for, based on how much of the stuff they push is used by us. They have no other rights. There are a few things you can do. One – sign this petition here. Dear TRAI, I am writing to express my concern against the actions that telecom carriers are taking to restrict fair access to the internet (Net Neutrality). 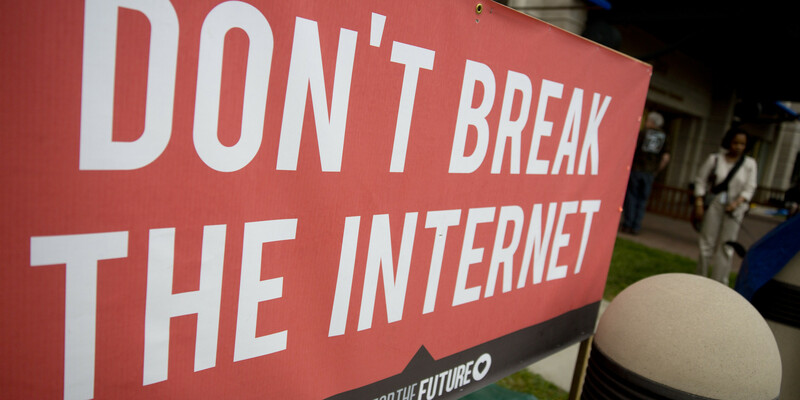 I believe the internet is a vital resource – it helps me communicate, work, and thrive as a citizen. If telecom operators can discriminate internet traffic on the basis of which services pay the most, we are allowing telcos control over a vital and necessary technological resource. By doing so we allow them to define what information we can view; what entertainment we can access; and how companies can innovate. This is completely unfair and harms India’s long term role in the global market. I strongly believe the growth of telecoms and the well-being of the internet can go hand-in-hand. I’m asking for a framework to ensure long term and fair access for all services regardless of size. I want my generation and those that come after me to have unfettered access to the Internet, with no telcos or ISPs having the ability to charge for specific services I use on top of it. Please understand that the internet is an important resource and vital to me and to every other Indian citizen. I would like to see it kept free and protected under Net Neutrality to ensure fair and equal access for all and forever. Three, if you do have access to Ravi Shankar Prasad, the telecom minister – or anybody else in the ruling party – tell them that you believe strongly in net neutrality and that you expect the government to take a strong stand on it. I don’t have that access – so I can also suggest a fourth option: share this piece on LinkedIn, or on Facebook or on Twitter, or on email – and get it across to your others. Someone, somewhere who reads it can make a call, make a point, or make a big difference. We have 2 weeks left. Let’s not allow the telcos to get away with this. Mahesh is a Venture Capitalist, Marketing Consultant. He is also the Managing Partner Seedfund, Founder Pinstorm.